My January and April posts on the Ontario electricity sector described how decisions by different Ontario governments gave rise to excess electricity generation with an inflated cost structure, leading to higher electricity prices. Here I discuss the latest development, the Liberal Government of Ontario’s proposed financial framework for its “Fair Hydro Plan” (FHP). In election mode, the Government tabled Bill 132 on May 11, introducing a mechanism to finance the FHP, creating a 17% price reduction in the short-term, but failing to acknowledge the significant price increases and massive debt that will result in the long-term. Although opposition parties have come out forcefully against Bill 132, the Liberal Government has a legislative majority and has time-allocated debate, so it will likely become law before the Legislature rises for summer. This post provides financial projections related to the FHP and shows that it is driven by craven electoral calculations rather than efficiency or equity considerations. I also review the financial and governance provisions in Bill 132, highlighting the risk that the type of “structured finance product” (SFP) being introduced in this legislation could be imposed elsewhere in Canada. Figure 1 builds on and extends my earlier work, presenting costs and prices in constant 2016 dollars. The costs are from the Independent Electricity System Operator (IESO) 2016 Long term Energy Plan (LTEP) “Outlook B” and uses Cabinet’s FHP projections for 2035-2050. I present two sets of prices; those of the Cabinet’s FHP and my “Alternative Plan.” To be clear, my objective in presenting the “Alternative Plan” is not to endorse the principle that Ontario should borrow to get itself out of the current electricity mess, rather than to address the structural issues I have discussed in previous posts, but instead to show that even accepting such a questionable principle, the FHP is a bad and “unfair” plan. 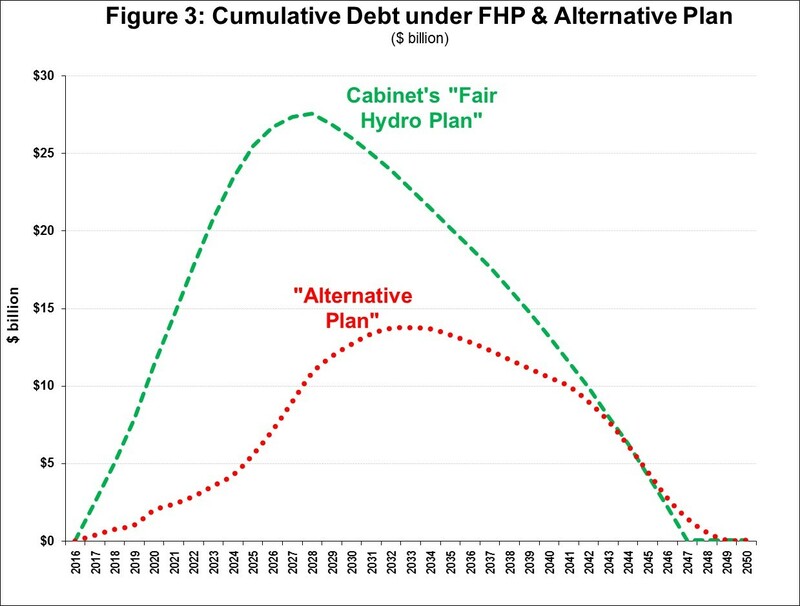 I calculated the “Alternative Plan” with the objective of having decreasing real prices to “smooth out” the underlying changes in costs, subject to a 30-year debt constraint and having my prices be lower than those of the “Cabinet FHP” during the payback phase. 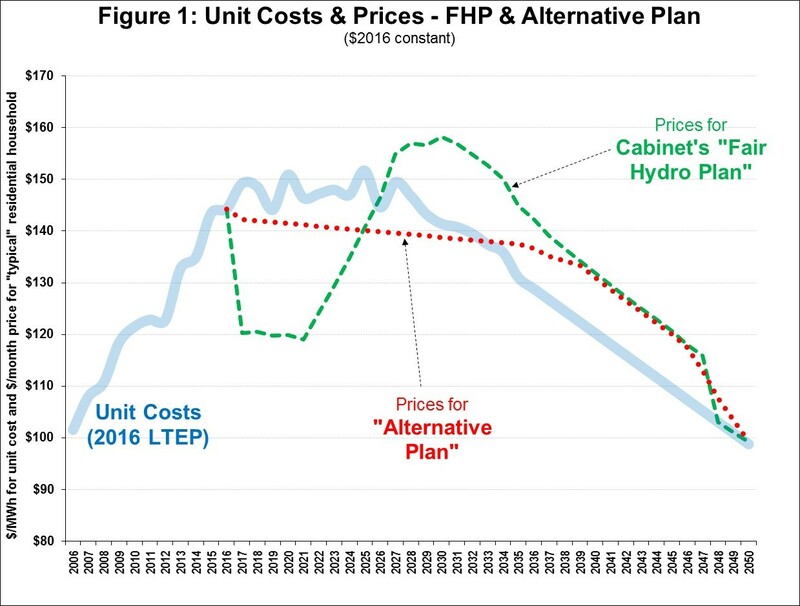 In contrast, the Cabinet FHP prices are driven by the Liberal Government’s electoral motive to show very significant price reductions over 2017-2021 period, but result in large increases in prices for many years afterwards. Figure 2 presents the same estimates in current dollars and shows that the difference between the two plans is significant. The “Short-Term Gain” that results from the needless borrowing due to electoral reasons can be calculated as the difference between the two plans during their respective borrowing phases. I estimate this “Needless Borrowing” at about $12 to $15 billion and proxy it in Figure 2 as a portion of the difference between the two price curves during the borrowing period (when both are below the cost curve). This additional borrowing has to be repaid, with interest, and can be calculated as the difference between the two plans during their respective repayment phases. As discussed above, the Cabinet FHP did not provide interest rate or weighted average life (WAL) of the financing instruments. However, the head of OPG has speculated that a 5% return could be reasonable. I ran a series of scenarios with an interest rate between 3% to 5% and WALs between 10 to 20 years to get an order of magnitude of the possible ranges. I settled for a conservative estimate of between $20 to $30 billion as the total difference in the payback amount between the two plans. These amounts includes principal and interest and is referred to as the “Long-Term Pain” in Figure 2 (proxied by the difference between the two price curves during the repayment phase (wehn both are above the cost curve). 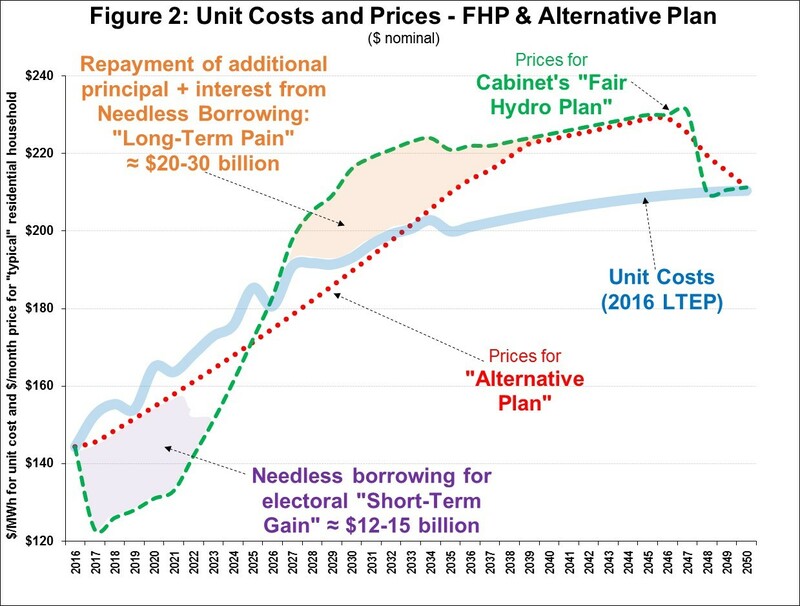 Figure 3 presents the total cumulative debt for the Cabinet’s FHP and the “Alternative Plan”, showing that the former peaking at around $27 billion, while the latter tops out at about half that, $13 billion (hence the estimated range of “Needless Borrowing” above of $12 to $15 billion). When seen in this comparative perspective, the Cabinet FHP is inefficient in that it borrows more money than necessary (double) to achieve the stated “fairness” objectives. Nor is it “fair” because it strongly favours rate-payers for a short period and strongly prejudices them for a longer period. The “Alternative Plan” is both more efficient and more equitable. Bill 132 introduces for the first time in Canada a bond type of “structured finance product” (SFP) that was first used in the electricity sector in California in 1997. The basic concept is that via specific legislation, a competent authority (usually the State electricity regulator) issues a financing order that authorizes an electricity company to establish a “bankruptcy-remote” special purpose vehicle (SPV) that issues a bond to borrow money from financial markets. That bond is securitized by pooling a future stream of payments directly from electricity rate-payers via a separate line-item charge. As such, these SFPs are sometimes referred to as Ratepayer Obligations Charge (ROC) bonds. For example, in California the state regulator (CPUC) mandated the “Competition Transition Charge” (CTC) to allow electricity companies to raise money to pay their approved “stranded costs” (the difference between past investments and other obligations incurred that are no longer recoverable after a defined event – that is – competitive market pricing, regulation or policy). The SPV structure is critical because it is designed to isolate bondholders from risk. For example, in 2001 one of the energy companies in California declared bankruptcy following the energy crisis in that state. However, the corresponding ROC bonds were not affected because the assets (the right to collect the CTC) had been sold to the SPV and were not part of the corresponding bankruptcy estate. Rate-payers had to continue to pay the CTC to bond-holders. ROC Bonds are a type of structured finance product because they relate to a fixed income that is collateralized by a pool of financial assets. SFPs also include asset-backed securities (ABS) that pool credit card receivables, home equity loans, etc. Indeed, the original California ROC Bonds were classified as ABSs’ but were rated AAA (compared to much lower ratings for “traditional” ABS) because they had irrevocable access to the ROC based on the pledge/guarantee of the State. While continuing to be considered SFPs, some recent ROC Bonds in the USA have been designed to be classified as corporate Bonds rather than ABS and have been able to be sold to a wider universe of investors (some of which have guidelines against investing in ABS). About USD $50 billion ROC Bonds have been issued in the USA since 1997, or about USD $2.5 billion per year. Ontario accounts for only about 4% of the USA population, but would issue an average of CAD $2.3 billion a year for about a dozen years, a disproportionately large amount. Bill 132 includes all of the elements listed above: it establishes Ontario Power Generation (OPG) as the “Financial Manager” and authorizes it to establish an SPV that would issue ROC-type Bonds that would be subsequently paid back to bondholders via the imposition of a “Clean Energy Adjustment” (CEA) charge on all Ontario rate-payers. Further, the Ontario Government pledges to not take any action or permit any action that would impair, reduce, or alter the value of the underlying property associated with the CEA charge. Keeping the ROC Bonds off Government Books. It is likely that one of the principal reasons the Government chose the ROC Bond approach was that the corresponding financing did not have to come from either Government revenues or additional debt. Hence the Government’s fiscal books would not be seen to further deteriorate in the context of the upcoming election. Further, because of the specific statutes, by selecting OPG as the originator entity (rather than other Ontario public entities), bonds to be issued by the corresponding SPV will not be considered as part of Ontario Government debt. Higher Costs of Privatized Debt. This legislation continues with the Ontario Liberal Government’s long-standing policy of incremental asset, and now financial privatization, of the electricity sector. The ROC Bonds will be incrementally more expensive to rate-payers compared financing the FHP via increased Government expenditures either via additional revenues or increase debt due to higher-than-necessary fees and commissions resulting from the new financing mechanism. Unchecked Ministerial Powers. I argued previously that the Ontario electricity sector has suffered from poor governance leading to the current over-supply and inflated cost structure. In essence, investment decisions have been driven by non-transparent Ministerial decree-making without any checks and balances. This is in contrast to sound governance processes with built-in “checks and balances” where decision-making is based on public and transparent regulatory or other type of process. This strategy continues under Bill 132; only the Minister has the authority to issue the required financing order to mandate the required borrowing. The Minister is not required to consult in issuing the order and the order is not subject to any OEB or public review. The Cabinet’s FHP is a craven political strategy that has more to do with electoral survival than sound electricity sector policy. Even taken on its face value, the Cabinet’s FHP is neither efficient (needlessly borrowing about $20 billion more than necessary) nor equitable (the Alternative Plan is more fair). The expected total amount of borrowing under the Cabinet FHP is disproportionate to all prior experience and on an annual basis would account for about three-quarters of the entire USA total, even though Ontario accounts for about 4% of the USA population.